Here's an edition that seems to fallen off the face of the Earth. 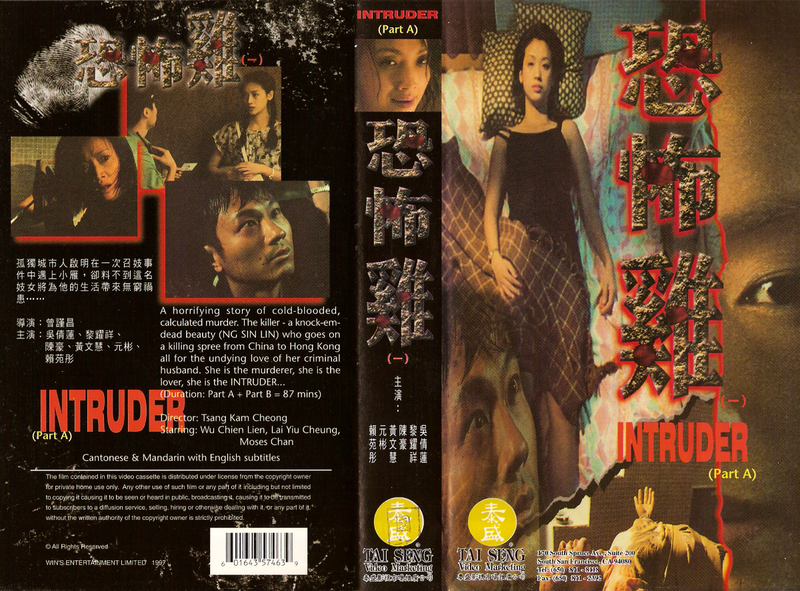 Intruder is a Hong Kong Category III nasty written/directed by Kan-Cheung Tsang who's presently known as a contributing writer to Stephen Chow's monstrous hit string. This became Tsang's only directorial effort and sunk into obscurity. The only editions I had ever heard of before this find are the China Star VCD and two German DVDs--one out-of-print uncut disc with English subtitles and another butchered of fifteen minutes for a FSK-16 rating. I didn't jump on the "good" German edition while available, but found this one last week, which doesn't seem to have a presence online anywhere besides a few posts from the seller on HK film forums. No idea why the 87 minute film is spread over two tapes. Tai Seng seemed weird about doing this on random titles with others unaffected. The distributor does leave a bad taste in my mouth for other reasons. TS is notorious for slapping company logo stickers on already English-friendly Hong Kong DVDs (and Blu-rays) that sell from importers for a fraction of what they deem the U.S. MSRP to be. I remember always seeing discs that I could get for like $7 direct from Hong Kong online for $30+ in-store. That's horseshit. Also Tai Seng's "in-house" discs, like The Untold Story, don't justify their high prices and are usually no better than the cheaper HK editions. Although this particular one is cool being so obscure. The "Part B" tape is in a whole other clamshell with the same cover just with "(Part B)" and two small red horizontal lines below the spine's title instead of just one. The wear on the back cover is supposed to be there, despite looking just like moisture damage. The covers and cassettes also have Chinese stamping over Tai Seng's logos. The uncut German version was re-released as extras (!!) on the uncut release of RUN AND KILL. They've still got a few copies at D&T in Austria (or so their page says anyway). Both are subbed in English. And I thought Paramount splitting the 130 minute Murder On The Orient Express onto two tapes was weird. It was common back in the day for HK companies to put out their films on two tapes. I've got a handful of those releases (one is Anthony Wong's "Love to Kill"). It was purely to earn more money on the films. Btw, not all releases had the same cover both parts. That's actually the single one thing I thought was cool; you'd get the same film with two different covers.